"We would not take our children to any other studio in SLO! The quality of lessons and professionalism by Danielle and Lacey is world class! Danielle has helped my son work through his voice change with patience and understanding. Lacey is an amazing instructor and makes it so fun to learn the instrument. If you want perfect balance of challenge and reward - this is the studio for you! Highly recommend!" "Sonja has been a student of Lacey McNamara's for more than 6 years. In that time, she has learned not only to read and execute the music on the page, but also to improvise, entertain, and understand music theory. Not all teachers take this comprehensive approach to piano, and we really appreciate the emphasis on the whole musician and understanding of music in general. Lacey is very organized and her steady guidance has created a friendly and dependable environment for study and practice. Sonja's relationship with her piano teacher has been consistent and reliable all these years, giving her the knowledge and confidence she needs to blossom into a complete musician. Thanks Lacey, for many years of learning that we hope to continue." 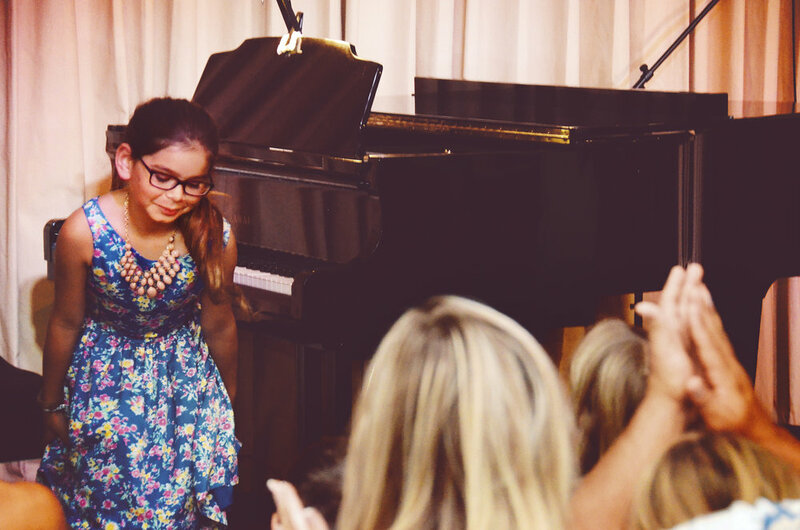 "My 12 year old daughter has been taking piano lessons from Lacey for 7 years. My daughter goes into her lesson with a good attitude and comes out with an even better one, smiling from ear to ear. Lacey is encouraging, patient, and knowledgeable. She is able to challenge my daughter in many ways, not just by playing piano. Lacey breaks down the components of various pieces and uses her abilities to transpire the meaning, feeling, and/background behind it. She has introduced my daughter to a wide range of composers and styles. This has enlightened my daughter’s appreciation of music and took her piano playing to another level. We are very fortunate to have Lacey as our Piano Teacher. She is very accommodating and inspirational. Thank you for believing in my daughter Abby." "Lacey is amazing. She is the first piano teacher we reached out to and are still with her. She has not only taught my two boys piano but some life lessons as well. She believes they need to learn how to manage their own tasks. They are responsible for their own lessons and practice time. My boys have been playing piano for over five years and she continues to challenge their interests. With Lacey’s help, they stay engaged and interested in piano. She is patient and understanding but strong and persuasive when needed. Our visits seem to be a comforting ending to our day." "I enjoyed my voice lessons with Danielle for many reasons! She always made an effort to make sure I was comfortable and was singing songs that I would enjoy. I thank Danielle for giving me the confidence and technique that I live with today."